Posted in: Music, Nature, Photography. Tagged: #Throwback Thursday, Butterfly Effect, Chaos Theory, In the Time of Our Lives, Iron Butterfly. I don’t know about the typhoon, but for sure it’s a gorgeous butterfly this one. Hopefully just a gentle breeze. 🙂 Thank you Elizabeth. Sayeth the magical maiden. 🙂 Thanks Trini. woow this is so crisp…love it! Like sunsets and flowers, I do not get tired of seeing butterflies. I have enjoyed their surprise visits to my small garden over the years and will be sad not to see any as the weather gets colder. However, I find comfort in knowing that not all of them die when it gets cold outside. Some of them migrate to warmer climates during the winter, while others go into hibernation. I agree, thank you for your commnet. Butterflies are a very important part of the ecosystem. 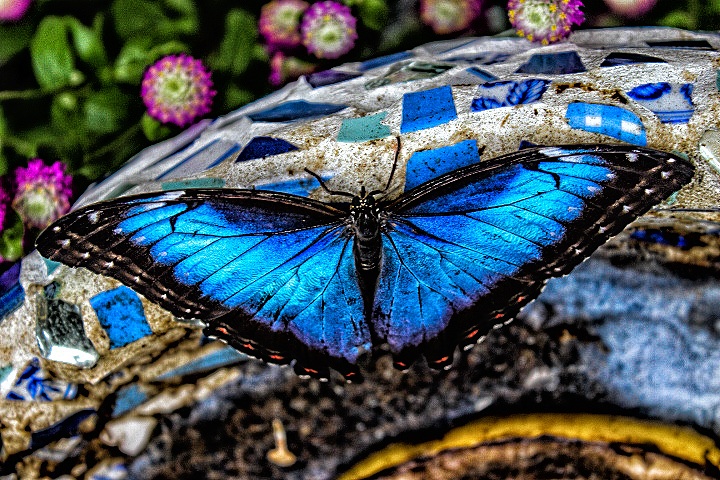 Extremely beautiful but it’s man’s indifference to environmental responsibility that is causing havoc in the environment… not these harmonious butterflies. So true, man is the culprit. Beautiful! The words remind me that we never know the effect will have on another.